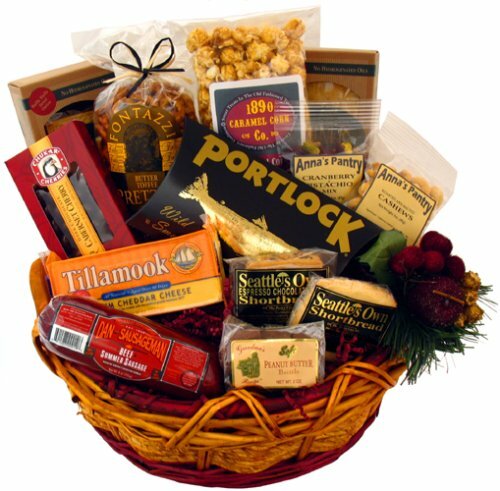 This gift basket is filled with Fontazzi Butter Toffee Pretzels, Partners Crackers, 1890 Caramel Popcorn, Chukar Cabernet Chocolate Cherries, Portlock Smoked Wild King Salmon, Tillamook Cheddar Cheese, Anna?s Pantry Cashews, Anna?s Pantry Pistachio and Cranberry Mix, Seattle?s Own Shortbread Cookies, Dan the Sausageman Sausage, and Northwest Candy Chocolate Peanut Butter Brittle. Some items may vary due to availability. Substitutions made will be of equal or greater value. If you have any questions about this product by Seattle Gift Basket Company, contact us by completing and submitting the form below. If you are looking for a specif part number, please include it with your message.